CHICAGO, 2018-May-17 — /Travel PR News/ — Mayor Rahm Emanuel and the Chicago Department of Cultural Affairs and Special Events (DCASE) announced today the lineup of 73 restaurants that will participate at the 38th Annual Taste of Chicago – the world’s largest free food festival – this July 11–15 in Grant Park. Showcasing Chicago’s diverse culinary scene, this year’s list of 38 five-day vendors, 22 pop-up restaurants and 13 food trucks will offer Taste-goers an endless variety of more than 300 menu items to suit every palate. This year a record-breaking number of applications were received from vendors across the city and beyond (Australia! ), representing a wide variety of cuisines. The Pop-up program is proving to be as popular as ever with a 114% increase of new pop-up vendors in the 2018 event versus 2017. All 75 vendors will offer signature items, as well as the popular “Taste Of” portions priced at $3.00 or less, allowing guests the opportunity to sample an even greater variety of items. Many will also include healthier selections as well as gluten-free and vegetarian options. Admission to the Taste of Chicago is FREE, and tickets for food and beverages can be purchased in strips of 14 tickets for $10. 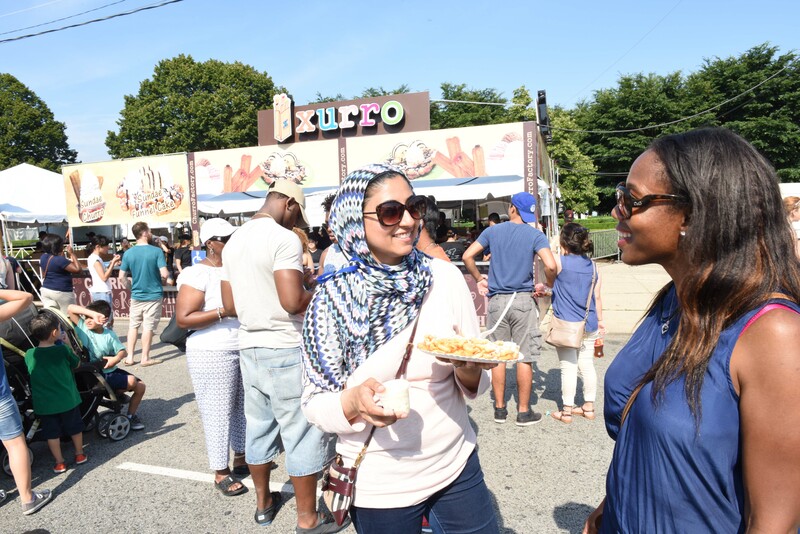 Whether craving the robust flavors found in ethnic cuisine, epicurean delights, sweet treats, classic Chicago dishes – and more – Chicagoans and visitors won’t want to miss this year’s Taste! The new Taste Oasis will offer Taste goers the opportunity to enhance their festival experience with access to an air conditioned lounge in Butler Field offering tasty bites, a private cash bar, music, refreshing water and much more. Classic cocktails created by CH Distillery include an Old Fashioned and Grey Hound. Day passes for this exclusive area are $50 and can be purchased at tasteofchicago.us. Also included in the cost are “Taste bites” prepared by Washburne Culinary Academy will be served Wednesday, Thursday and Friday, from 3 to 6pm and on Saturday and Sunday from 2 to 5pm. Taste Oasis will be open throughout normal Taste of Chicago festival hours, but it’s particularly a great spot to hang out before and after the Petrillo Music Shell concerts. Taste of Chicago will also present a diverse mix of national and international artists at nightly concerts at the Petrillo Music Shell that include Brandi Carlile, Juanes, yasiin bey & Talib Kweli are Black Star, The Flaming Lips and George Clinton Parliament Funkadelic—plus the best of Chicago’s local music scene on the Bud Light Stage. Tickets for the seating area at the Petrillo Music Shell start at $18 and are on sale now at the Taste website, tasteofchicago.us. As always, admission to the Taste of Chicago is free, as is lawn seating during the concerts. Taste of Chicago will present an assortment of local cultural programming that includes the Artist Garden featuring live painting by local artists, Chicago SummerDance with live music & social dancing on Buckingham Fountain Plaza (NEW this year), Kids Eat Chicago presented by Chicago Parent, the March of the Puppets daily musical procession through the festival grounds, pop-up performances by local artists in various locations and more. The CH Vodka Cocktail Lounge will offer mixology specials to enjoy by Buckingham Fountain. The specialty cocktail menu during the Taste of Chicago will include CH’s Fresh Ginger Mule, Tropical Rum Punch, Raspberry Lime Ricky, Bourbon Pineapple Smash and other specialty drinks. The Beer Hall and Stella Rosa Wine Gardens will offer additional scenic areas on Buckingham Fountain Plaza for Taste goers to enjoy unique beers and ciders from around the world and an array of wine varietals including Bodega Sangria, Stella Rosa, Mariella Rose and Maddalena from the Riboli Family Wine Estates. The Lifeway Foods Taste Kitchen dishes up a full menu of cooking demonstrations by local and national chefs on Buckingham Fountain Plaza. New this year, the area will feature a different theme each day. Highlights include, Chef Kevin Hickey of Duck Inn on Wednesday, July 11 during Chicago Neighborhood Day representing Bridgeport. Executive Chef and Bravo Top Chef Season 15 Winner, Joe Flamm of Spiaggia will be featured on Friday, July 13 as part of the lineup for Pairing Day. On Sunday, July 15 the Emmy Nominated Chef, Jeff Mauro–Food Network’s “Sandwich King”–will be hosting Sandwich Smackdown Day featuring friendly sandwich showdowns with two chefs battling it out for sandwich supremacy. The full schedule of Chef demonstrations will be announced in June. The Taste of Chicago has seen a surge in popularity since it was shortened to five days and new elements added, including the Taste Oasis private lounge, pop-up restaurants, food trucks, chart-topping musical acts and cultural programming. In 2017, Chicago’s iconic festival served culinary delights to 1.6 million visitors. Additionally, up to 3,000 people were employed by Chicago restaurants and vendors, and more than 600 artists and performers were hired to entertain Taste-goers over the five-day festival. The event contributes an estimated $106 million annually in total business activity to the Chicago economy. Taste of Chicago is produced by the Department of Cultural Affairs and Special Events in coordination with the Illinois Restaurant Association, which manages food and beverage operations. The festival is sponsored in part by 93XRT, Bud Light, CH Distillery, Chicago Transit Authority, Chicago Tribune, CLTV-Chicagoland’s Television, Communications Direct, Eli’s Cheesecake, IL Lottery, Lifeway Foods, Pepsi, Shoreline Sightseeing, Southwest Airlines and WGN-Television. The 38th Annual Taste of Chicago is July 11–15 in Grant Park with hours 11am–9pm, Wednesday–Friday, and 10am–9pm, Saturday and Sunday. For more information on the FREE admission festival, visit tasteofchicago.us. To plan your trip to Chicago, visit choosechicago.com. Join the conversation on Facebook at Taste of Chicago and follow us on Twitter, @TasteofChi (#TasteofChicago) and Instagram, @ChicagoDCASE (#TasteofChicago). Founded in 1914, the Illinois Restaurant Association is a non-profit organization dedicated to promoting, protecting, educating and improving the restaurant industry in Illinois. The Association manages the food and beverage portion of Taste of Chicago for the Department of Cultural Affairs and Special Events. Visit illinoisrestaurants.org and follow on Facebook, Twitter and Instagram. This entry was posted in Entertainment, Festivals and Events, Food & Drinks, Tourism, Travel, Travel Marketing, Travel Services, Travelers. Bookmark the permalink.